All-purpose tubular ideal for rough terrains like cobblestones, or not perfectly paved roads, its tread guarantees the best grip for this kind road surfaces both wet or dry, the larger (25mm) width will reduce the risk of flats, all these qualities in a contained weight of only 280gr. 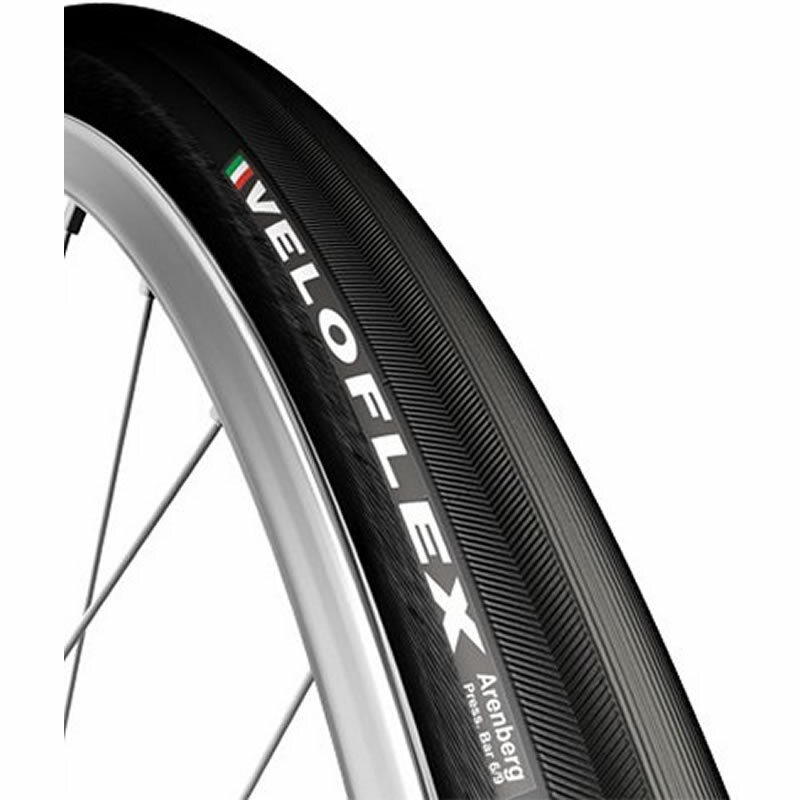 A fine pro-competition or everyday high performance tubular with outstanding grip and low rolling resistance. Its tread supplies great cornering stability and traction control both on dry and wet roads. The new 320 TPI corespun casing will give you the best available weight, lowest rolling resistance and comfort. Roubaix is available in all black only. Constructed utilizing a latex inner tube for the utmost in low rolling resistance. Casing features a Calicot puncture resistant layer under its natural rubber tread to help ward off road hazards. I started riding Veloflex around 5 years ago and they never dissapoint. They will give you a soft ride (for example at 170 plus I only pump them up to 70 psi back/60 front for their 27mm tires, 10 more psi each for the Arenbergs. They will also wear slowly and rately ever flat, at least on decent roads. All in all I rather pay a bit more for these and know I have top quality than on other cheap brands. I've been itching to try Veloflex for a while now and as soon as my recent tubs expired I took the plunge. Superbly made, easy to fit and a super price from Merlin. These however are the tip of the iceberg in terms of benefits - quite simply the ride is sublime and the grip is outstanding compared with my previous Vittoria Corsa Evo/CX tubs I was running. So far so good in terms of wear/punture resistance but I'm super pleased with the purchase and top marks to Merlin for their assistance and promptness of delivery. I have been on these 25mm for about three years and they are great as always. You can`t go wrong with Veloflex; its all I ride. This is my favorite tubular tire right now. It is a joy to mount on a rim, compared to the super-tight Continental tubulars that I used to use. I weigh about 168 lb and I run this tire on my Zipp wheels for day to day riding. I use ~90 lb psi in both the front and back and that provides a very comfortable ride. The tires are long lasting; I think I got about 9 months/ 6300+ miles on the rear before it finally wore out, and the front still looks good.